As we have seen, Cheeky Weekly used framing devices as a way of incorporating certain strips within Cheeky's Week; James Bold's early adventures were presented as chapters of a novel which Cheeky read each issue, and episodes of the final Bold series were watched on the big screen by Cheeky and his pals during their Saturday morning trips to the cinema. 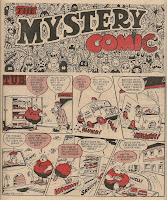 The Mystery Comic was another framing device to introduce a new batch of features as from September 1978. 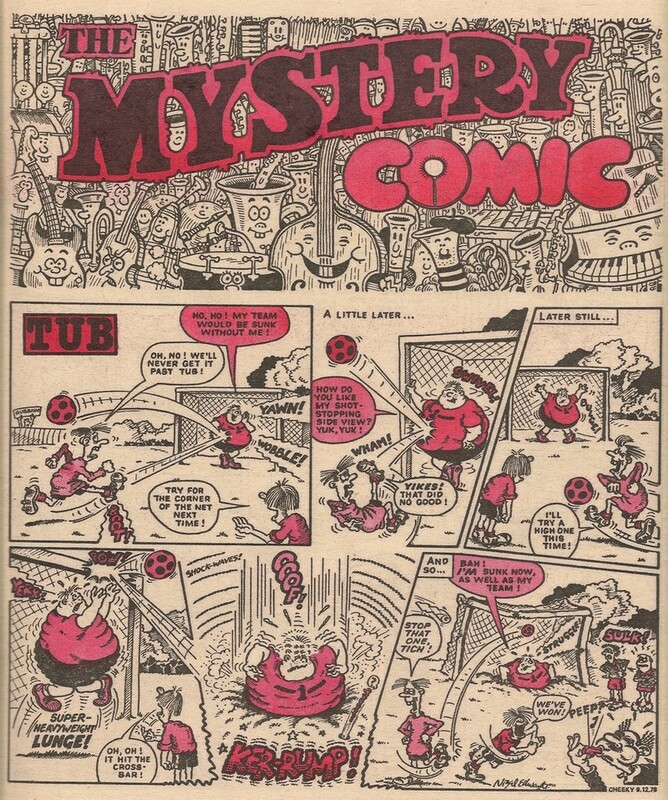 From the first issue of Cheeky Weekly, readers had been intrigued by Cheeky's weekly search for a copy of The Mystery Comic, a publication which was evidently not sold in the newsagents of Cheeky's neighbourhood. In those early days, the toothy funster sought out a copy of the mysterious publication with the intention of reading only Mustapha Million's adventure, so no other strips from The Mystery Comic appeared in Cheeky Weekly. However, our grinning pal's comic underwent a major revamp in the issue dated 30 September 1978, and from this date the whole of The Mystery Comic appeared in the centre pages of Cheeky Weekly. This comic-within-a-comic format had been used by IPC a number of times before, most famously in the long-running Whizzer and Chips (and Cheeky Weekly itself would become a comic within Whoopee! after it merged into that title). Unlike Whizzer and Chips, Cheeky Weekly didn't invite readers to extract the title located at the centre from within the main comic, neither was there any rivalry between the characters from the host and guest comic as there was in Whizzer and Chips, where 'raids' from one comic into the other happened on a regular basis - from Cheeky's viewpoint the characters in The Mystery Comic (with the exception of the lead characters from Elephant On The Run - see below) were presumably fictional, so raids were impossible. The other Mystery Comic strip was existing feature Mustapha Million which, for the duration of The Mystery Comic's run, relocated within its pages. 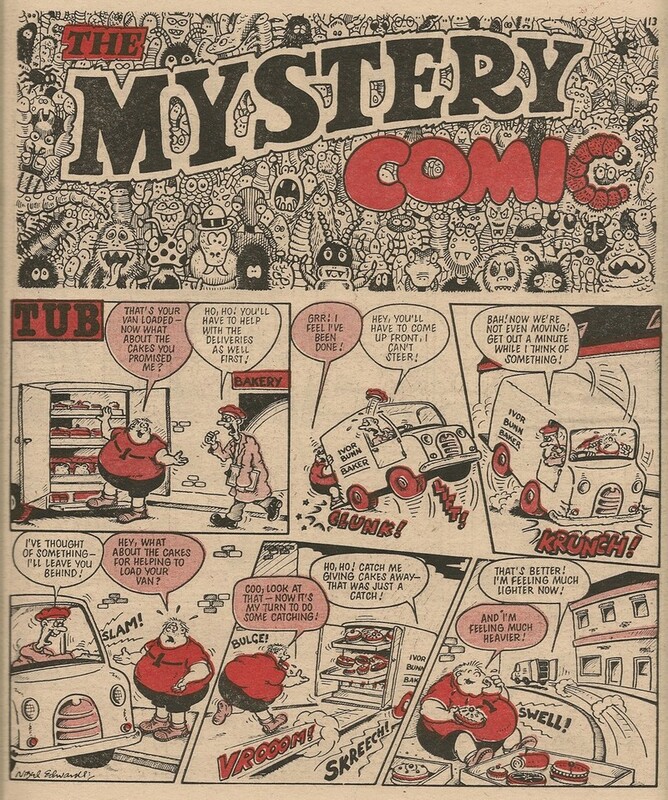 The Mystery Comic appeared as a conceptual grouping of features in 37 issues of Cheeky Weekly. 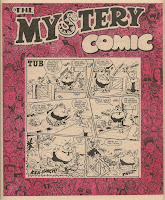 On the cover of the issue of Cheeky Weekly in which The Mystery Comic made its debut, was a headline which read "At Last! The Mystery Comic is to be seen inside. ALL OF IT! ", so it was evidently a rather thin offering at only 8 pages. 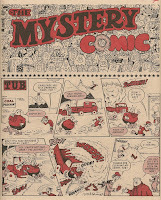 However, only 14 issues contained 8 pages of features in the Mystery Comic, which coincidentally was the same number of issues containing a 7-feature-page Mystery Comic. 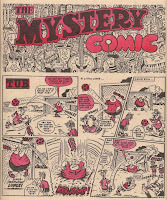 7 issues had a 6-feature-page Mystery Comic and 2 issues (19 May 1979 and 16 June 1979) had Mystery Comics with only 5 pages of features, the lowest number of features to appear in the mysterious publication. 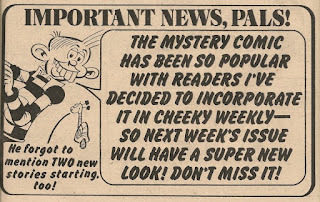 The reduced Mystery Comic page count was due to adverts, or cut-out features relating to Cheeky Weekly intruding into The Mystery Comic's pages. 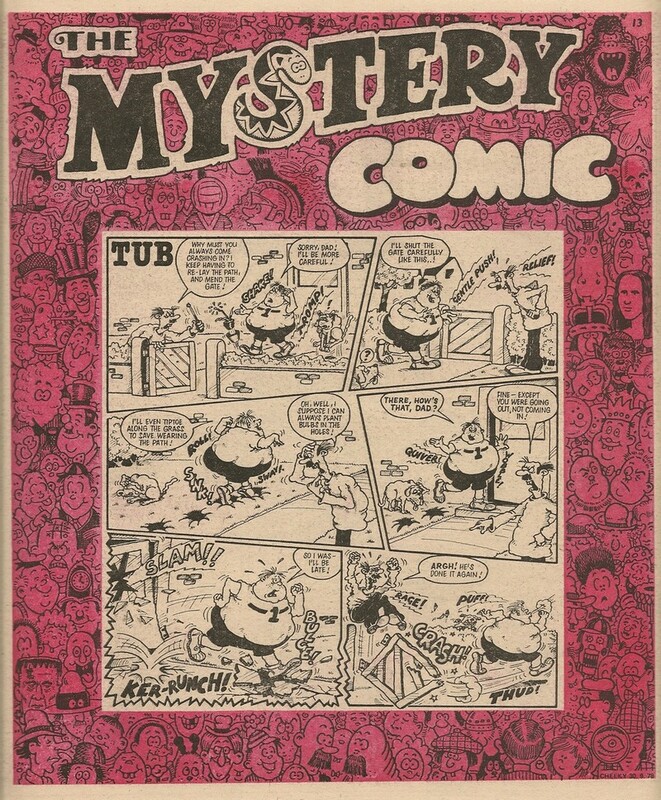 For example, the cover of Cheeky Weekly dated 19 May 1979 tells readers that part one of the Spotter Book of Town and Around is inside, yet the pages of the book are printed within The Mystery Comic, although the mysterious publication's cover makes no mention of it. The cover of the first Mystery Comic incorporated a snake into the S in the comic's title. The title appeared over a background, consisting of numerous faces, drawn by Ed McHenry. Over its run, The Mystery Comic featured 5 title-and-background designs, which repeated at random over the weeks. Accompanying the snake version of the logo was a background including King Kong, Elsie Tanner (from TV's Coronation Street), the Mona Lisa, Frankenstein's monster and Sherlock Holmes. The second background had a food theme and featured anthropomorphised ice cream cones, lollies, chocolate bars and fruit. In this version of the cover, the letter O in the word comic was represented by a ring doughnut out of which a bite had been taken The third variant showed a rather threatening bunch of creepy-crawlies, with the second C of the word comic being substituted by a caterpillar, while the fourth showed a horde of musical instruments, in which the O of comic is represented by a drum skin with a beater resting on it (I think). The fifth version had a science fiction motif, depicting among others Buck Rogers, Chewbacca, Tom Baker as Doctor Who and Mr Spock. This version of the cover featured a cratered planet or moon in place of the O in comic. I've never been able to work out what relevance the snake in the comic's title has to the background characters on that version of the cover. The snake cover appeared 8 times, the food and creepies appeared 6 times each, music 9 times, and sci-fi on 5 occasions. The snake and sci-fi backgrounds both surrounded the cover strip, while the remainder of the backgrounds were limited to the top of the page. 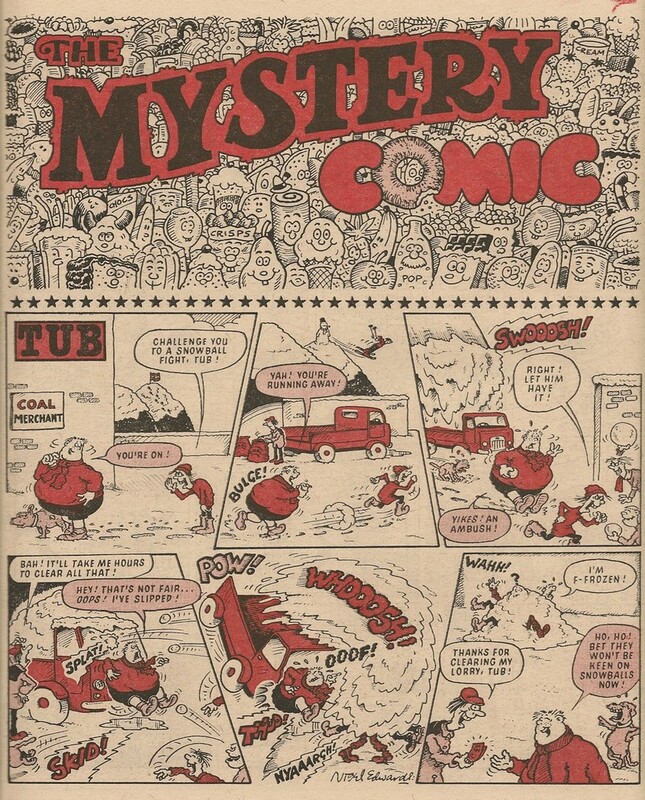 Tub was the cover star of 34 issues of The Mystery Comic, with Disaster Des occupying the cover twice, and Why, Dad, Why? featuring on the cover on one occasion. Only the covers featuring Tub included the Ed McHenry backgrounds, the others had less elaborate backgrounds, or no background at all, and a different title design. The Mystery Comic covers weren't dated or numbered, neither was a price shown. It seems that in Cheeky's universe The Mystery Comic was free, which would explain the low page count. Most frequently The Mystery Comic was to be found commencing on page 13 and spanning 8 pages. However, on occasion the mysterious publication was shunted forward within Cheeky Weekly. The closest it got to the front of the host comic was in Cheeky Weekly dated 09 December 1978, one of the issues which was reduced to 28 pages due to an industrial dispute, when The Mystery Comic commenced on page 9. 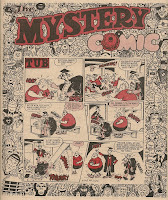 The 02 December 1978 Cheeky Weekly (another reduced issue) was the only issue in which the cover of the Mystery Comic was situated on an even-numbered page (10), which is another reason why removing the mysterious publication from within its host was never advocated. Elements from Cheeky Weekly would quite often appear in The Mystery Comic. For example in The Mystery Comic dated 02 December 1978, the 'Big 4 Comics Saint Competition' appeared on the page after Tub. In the 09 December 1978 issue (as mentioned above, a truncated Cheeky Weekly), the Thursday element of Cheeky's Week and the Smurfs competition intruded into The Mystery Comic, as both features followed Elephant On The Run but preceded Disaster Des. 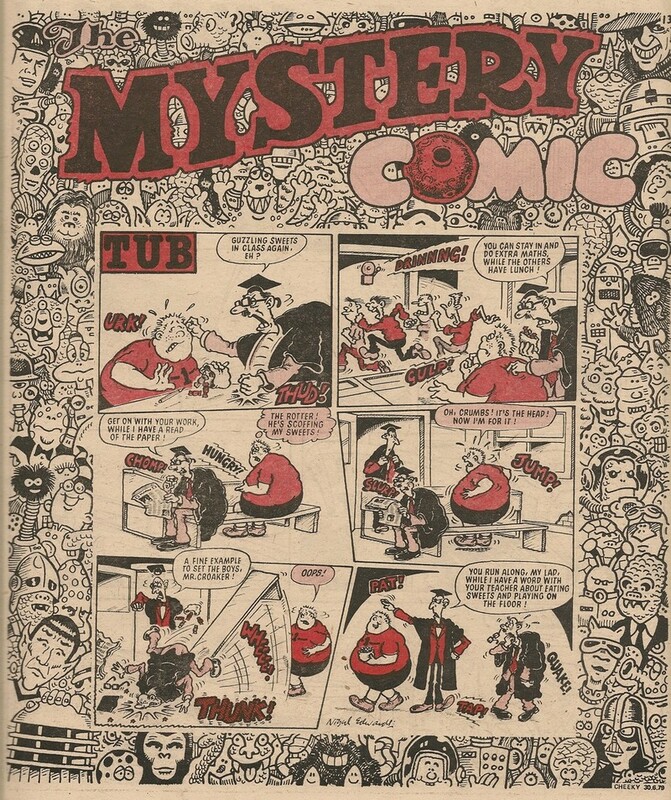 The concept of The Mystery Comic came to an end in Cheeky Weekly dated 30 June 1979 in which Cheeky announced that the enigmatic funny paper was so popular that he had decided to incorporate it into his own comic, and thus the Mystery Comic title page was not seen again. 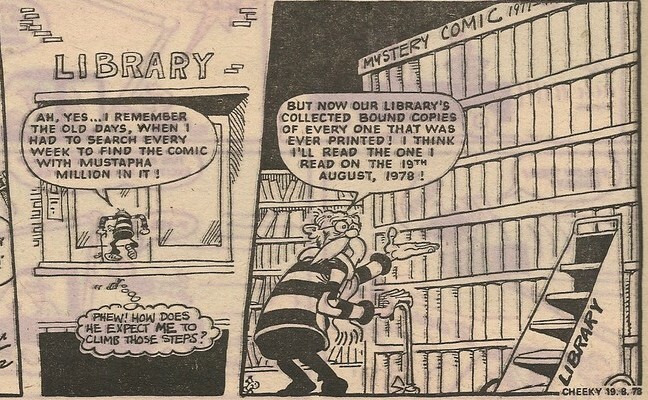 However all the strips from The Mystery Comic continued to appear in Cheeky Weekly, but they were no longer confined to the pages around the centre of the comic. In the table below, where the cover of TMC is located on an odd-numbered page and the total number of TMC pages is odd, the procedure I wrote to gather the data extends the end of TMC to one page after the final TMC feature in that particular issue, to make an even number of pages. For example in TMC in Cheeky Weekly dated 07 April 1979, the procedure considers page 22 of the host comic (featuring an ad) to be the final page of TMC that week. 28-Oct-1978 13-Tub/14-Mystery Boy/15-Ad: IPC/15-Ad: IPC/16-Elephant On The Run/17-Elephant On The Run/18-Mustapha Million/19-Mustapha Million/20-Disaster Des 8 Why, Dad, Why? 25-Nov-1978 13-Tub/14-Mystery Boy/15-Ad: Woodcraft Village/16-Elephant On The Run/17-Elephant On The Run/18-Mustapha Million/19-Mustapha Million/20-Disaster Des 8 Why, Dad, Why? 02-Dec-1978 10-Tub/11-Ad: Big Four Saint Competition/12-Mustapha Million/13-Mustapha Million/14-Elephant On The Run/15-Elephant On The Run/16-Mystery Boy/17-Disaster Des 8 Why, Dad, Why? 13-Jan-1979 13-Disaster Des/14-Mustapha Million/15-Mustapha Million/16-Snap Game/17-Snap Game/18-Elephant On The Run/19-Elephant On The Run/20-Mystery Boy 8 Tub/Why, Dad, Why? 20-Jan-1979 13-Disaster Des/14-Mustapha Million/15-Mustapha Million/16-Snap Game/17-Snap Game/18-Elephant On The Run/19-Elephant On The Run/20-Mystery Boy 8 Tub/Why, Dad, Why? 07-Apr-1979 11-Tub/12-Elephant On The Run/13-Elephant On The Run/14-Star Guest/15-Tease Break/15-Ad: IPC/16-Top Ten Poster/17-Top Ten Poster/18-Mustapha Million/19-Mustapha Million/20-Mystery Boy/21-Disaster Des/22-Ad: WH Smith 12 Why, Dad, Why? 14-Apr-1979 11-Tub/12-Elephant On The Run/13-Elephant On The Run/14-Mystery Boy/15-Ad: IPC/15-Ad: IPC/16-Top Ten Poster/17-Top Ten Poster/18-Disaster Des/19-Star Guest/20-Mustapha Million/21-Mustapha Million/22-Ad: KP 12 Why, Dad, Why? 19-May-1979 13-Tub/14-Mustapha Million/15-Mustapha Million/16-Ad: Trebor/17-The Cheeky Spotter Book of Fun/18-The Cheeky Spotter Book of Fun/19-Mystery Boy/20-Disaster Des 8 Elephant On The Run/Why, Dad, Why? 02-Jun-1979 13-Tub/14-Mustapha Million/15-Mustapha Million/16-Elephant On The Run/17-Elephant On The Run/18-Mystery Boy 6 Disaster Des/Why, Dad, Why? Cheeky's weekly scouring of Krazy Town for his copy of The Mystery Comic usually ended with one of his pals handing the toothy funster a copy of the mysterious publication. The source of the comic always remained unknown as Cheeky never asked his pals where they got it. 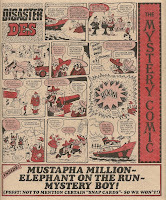 During the period that Mustapha Million was the only Mystery Comic strip printed in Cheeky Weekly, Cheeky sought out a copy on Fridays (issues 22 October 1977 to 24 June 1978) or Thursday (issues 01 July 1978 to 23 September 1978), but for the duration of the full Mystery Comic's run, Cheeky went in search of it on Wednesday. This shunt forward in the week was obviously due to the need to get The Mystery Comic into the centre of Cheeky Weekly. In the issue of Cheeky Weekly in which the full Mystery Comic made its debut, Cheeky visited the printers to get hold of what he told us was the "one and only copy", and in the 09 June 1979 comic Lily Pop told Cheeky she had found "this week's only copy" of TMC. The fact that, in Cheeky's universe, only one copy of each issue exists probably explains why no price is shown on the cover. 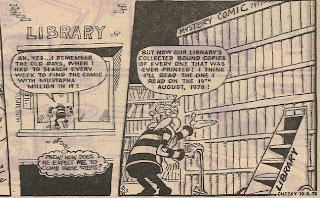 In the 10 February 1979 issue Cheeky tells us that the Mystery Comic can't be found in shops, although on more than one occasion Cheeky found a copy of TMC in Granny Gumdrop's shop (admittedly not for sale). 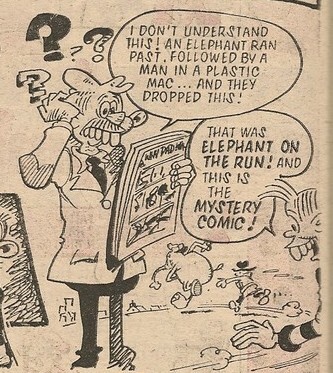 In Cheeky Weekly dated 12 May 1979, The Mystery Comic is dropped by either The Elephant or Man in the Plastic Mac from Elephant On The Run, as they dash past Cheeky's Dad. All of the main characters from The Mystery Comic appeared on Pin-Up Pal posters in Cheeky Weekly, with the exception of Mystery Boy. Mustapha Million's poster appearance pre-dates the debut of the full Mystery Comic. The Mystery Comic, or characters appearing therein, made it to Cheeky Weekly's main cover feature on 9 occasions, with Mystery Boy and Mustapha Million getting the cover treatment twice each. In Cheeky Weekly dated 19 August 1978, Crystal Belle gives Cheeky a glimpse into his life in the year 2038. On Thursday in that issue, the toothy funster of 2038 visits the library to peruse their bound volumes of The Mystery Comic. The Mystery Comic exists in Cheeky's universe, but is evidently not included in the Cheeky's universe version of Cheeky Weekly, since in the toothy funster's world only one copy of TMC is printed each week. Therefore, the version of Cheeky Weekly available in Cheeky's universe either must have had a different feature on the page where Mustapha Million appears in the version of Cheeky Weekly available in our universe from the first issue until the comic dated 23 September 1978, and also must have either had partially different content or been reduced in page count from 32 to 24 pages when TMC began being printed in full in Cheeky Weekly dated 30 September 1978.
of strips in the centre pages. Frank McDiarmid in the 21 April 1979 issue. In Cheeky Weekly dated 12 May 1979, Cheeky's Dad is seen holding a copy of TMC. The Why, Dad, Why? strip is shown on the back cover, yet it was actually on the front cover in the version of TMC that was printed in our universe. What actually was the ‘mysterious’ component that bound the strips together? Only Elephant on the Run seemed to truly qualify, with Why Dad Why debatably fitting the bill with Son’s constant questioning. You respond by saying “It’s a mystery,” and I’ll…! I'm not going to say it, don't worry! I've always assumed that the mysterious element was the fact that the comic wasn't available in the shops in Cheeky's universe, and nobody seemed to know where it came from, rather than the name having any reference to the contents. I don't think Cheeky DID know the secrets of The Mystery Comic!